Summer has been busy and full of events for the society this year. On 28th July society secretary Andy Exton attended a Family Fun Day at the Hospital Social Club to promote the society and to give the visitors a chance to safely observe the Sun. 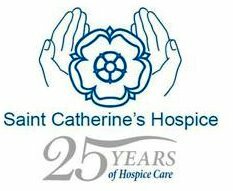 The event was very successful and raised £2,429 for St Catherine’s Hospice and Macmillan Nurses. 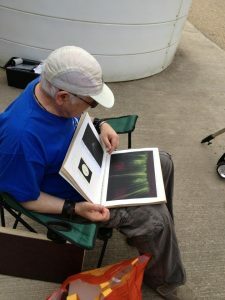 John Harper FRAS showing some of his sketches in his observation books. 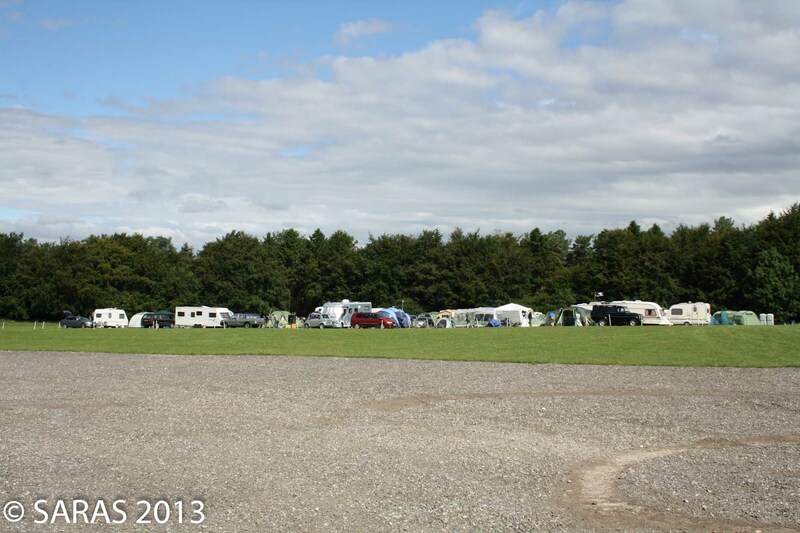 August 4th saw the final members social in Dalby Forest. The weather forecast wasn’t as favourable as it had been for our previous days, but our members were kept entertained by Honorary President John Harper FRAS, who brought along his wonderful observing books and sketches for us to look through, as well as an interesting astronomical umbrella! Members of the public were able to catch brief glimpses of the Sun through patchy to thick cloud. Birthday cake was enjoyed by all, and a double sing-a-long of ‘Happy Birthday’ was performed for two society members. 7th August saw members of the society set off for Adderstone Field to mark out the field for our annual Starfest camp, and begin preparations for the biggest event on our calendar. 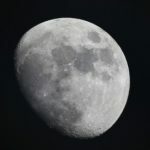 The members who camped over night on the Wednesday were treated to a clear sky, but the temperatures dropped rapidly and conditions became too dewy to observe for any considerable length of time. Our first arrivals came on Thursday afternoon, and by early evening there was a buzz around the field as everyone mounted and balanced their telescopes. However, the skies were not so kind and the evening remained cloudy with no chance of observing. 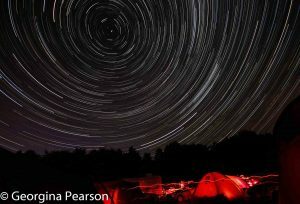 Fantastic star trails taken during Starfest. Friday saw the official start to the weekend, with Honorary President John Harper FRAS giving visitors a warm welcome to the 13th Annual Starfest, and a delicious hog roast dinner. A special recorded message was played to a packed marquee. Our first talk of the weekend was provided by Stuart Atkinson from Eddington AS, and was on Martian Rovers. As darkness fell, the clouds vanished and the Dalby skies were alive with stars and Perseid’s. The Milky Way stretched across the sky, from horizon to horizon. Saturday was a fun-filled day with talks from Gary Poyner on an Introduction to Variable Star Observing and Gary Fildes of Kielder Observatory on an Evening with the Hubble Space Telescope. Throughout the daytime, Grovers of Northallerton and Astroparts of Milton Keynes were available in the marquee for attendees to purchase equipment as well as an impromptu scope surgery by Dr. Juergen Schmoll. Conditions on the Saturday night were patchy cloud so little observing was possible. Just one of the many entries in the rocket competition. 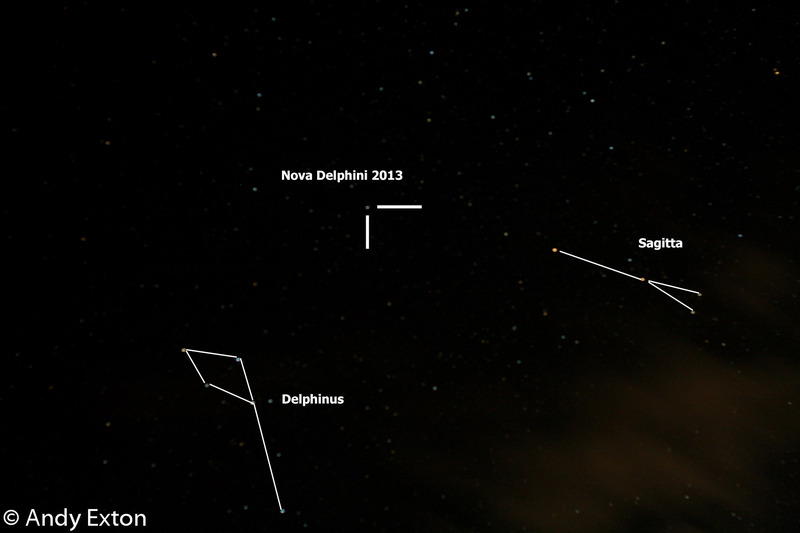 Nova Delphini 2013 captured on 16th August 2013 from Dalby. 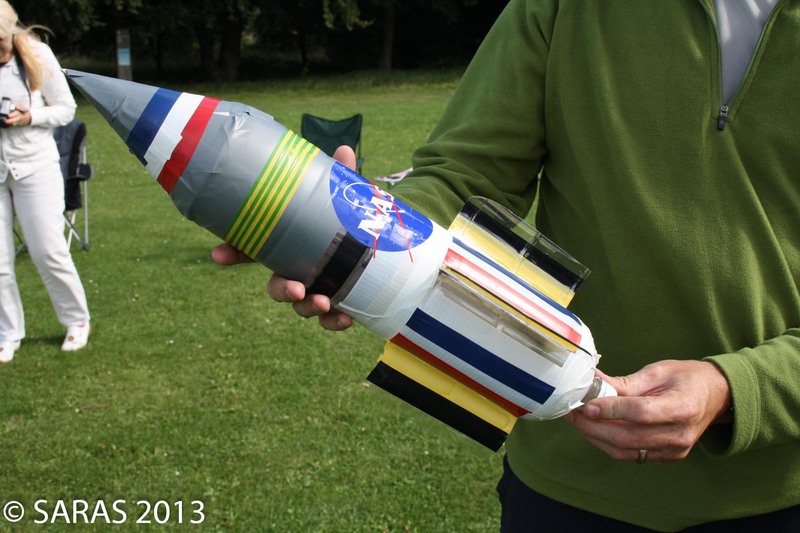 Sunday morning saw the annual rocket competition with a record number of entries. The event was won by society members Megan Ward and Alicia Jeffery. The annual astromind quiz was hosted by John Harper FRAS and 4 teams entered with Durham just pipping the SARAS team by 39 points to 36. Sunday night was again clear allowing a final night of observing and imaging to take place. Again, a considerable display of Perseids was on show under the dark, Milky Way filled sky. Friday 16th August saw the first members night at Dalby since the observatories were repaired. A number of society members attended and were able to enjoy some clear skies and among the objects observed was Nova Delphini 2013 which was approaching the peak of its brightness and was clearly visible to the naked eye despite a considerable Moon. Members were also able to experiment with some widefield photography of constellations. Now the observatories have been returned to working order, members nights will be held in Dalby on the 2nd and 4th Friday of each month. Please note, these evenings are not open to members of the public. For public observing events, please check our events calendar and for information on joining the society, please visit our membership page. 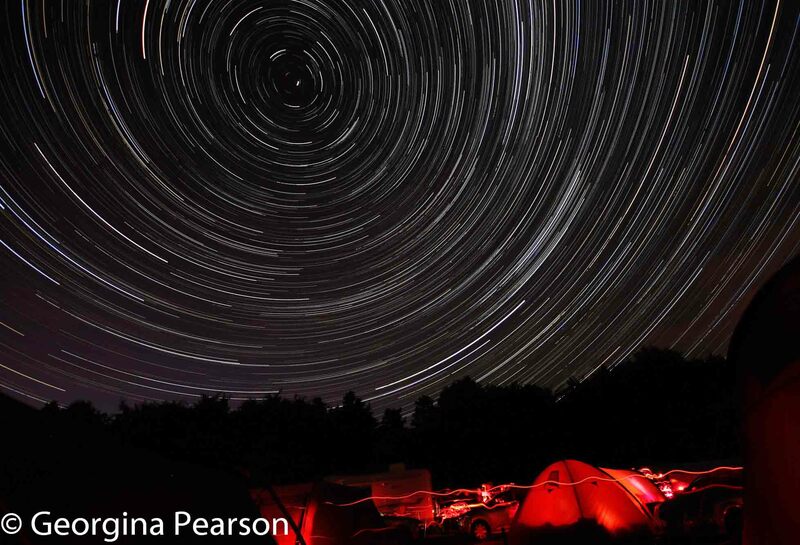 This entry was posted in Events, Member events, News, Observatories, Observing, Public Outreach, Starfest and tagged Andy Exton FRAS, Astroparts, Dalby Forest, Dr Juergen Schmoll, Eddington Astronomical Society, Gary Fildes, Gary Poyner, Grovers, John Harper FRAS, Kielder Observatory, Nova Delphini 2013, Perseids, Sketches, Starfest, Starfest 2013, Stuart Atkinson, Sun. Bookmark the permalink.